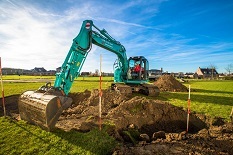 Kobelco expands its range of shortradius excavators - SK140SRLC-5 - Kobelco Construction Machinery Europe B.V. Since 1995, Kobelco has focused on developing its short radius (SR) excavators and the new Generation 5 model is testament to its success. The SK140SR-5 can operate in tight spaces and offers powerful performance, excellent stability, smooth control, exceptional low noiseand increased fuel efficiency. This machine is the latest in an impressive line-up of new models to be released by Kobelco in 2016. The new SK140SRLC-5 features Kobelco’s innovative iNDr (Integrated Noise and Dust Reduction) system, which promotes low noise, exceptional engine cooling, increased reliability and enhanced operator comfort, which is comparative with the -3 machine. And, even though the Generation 5 model features a number of additional components, its streamlined shape is not compromised due to a new and improved layout. The machine’s new arrangement also incorporates the re-positioning of the urea tank and a vertically-mounted DOC and selective catalytic reduction device (SCR). This new layout provides more convenient access for maintenance and additional protection of key components. The rear-view camera aids low-level visibility while the right side camera, fitted as standard, offers a wider all-round view. In addition, the SK140SRLC-5 complies with Stage IV of the exhaust emissions regulations. Engine performance has increased from 74 to 78.5kW, and it is fitted with a diesel oxidation catalyst (DOC) and SCR to control emissions without using a diesel particulate filter (DPF). This feature adds to the machine’s environmental credentials, particularly for urban and residential job sites, while still ensuring a powerful performance andmaximum working efficiency. The SK140SRLC-5 has a large-capacity (33.9-litre) DEF/AdBlue tank, which results in fewer fill-ups for maximum continuous uptime and productivity. The SK140SRLC-5 will start to arrive in authorised dealers across Europe in July.